TAOS, NM — In the Agnes Martin Gallery at the Harwood Museum of Art in Taos — an octagonal room designed in collaboration with the artist — a skylight at the center of the ceiling provides virtually the only illumination for the space. There are small spotlights mounted above each of the seven square canvases on display, but they have little effect. When a cloud passes overhead, the paintings all but disappear. The passage of light is integral to the experience of the artworks, which were done between 1993 and 1994, a decade before Martin’s death. As chronicled in Nancy Princenthal’s exquisite biography, Martin discouraged photographs and catalogues of her paintings, and the gallery at the Harwood is the proving ground for her misgivings. No form of visual documentation can convey the rhythm between the works as you move around the room, where the paintings’ pale blue and ivory white horizontal stripes expand, contract, dissolve, and reappear. It’s a sensation of the sea swelling or fog dissipating in a gust of wind. The first painting you encounter, to the right of the doorway, “Untitled (Lovely Life),” features four blue bands and four white ones. The alternating colors are arranged so that a blue stripe hugs the top while a white one stretches across the bottom, a dark-to-light pattern that carries with it a feeling of weightlessness, as if the blue bands were clouds lifting off the horizon. In contrast, the next canvas, “Untitled (Love)” is painted with four narrow, evenly spaced blue stripes, constituting a severe disruption of the uniform color intervals in the previous painting. There is one stripe at the top and one at the bottom, with the two remainders roughly dividing the white field into thirds. The shift from the previous painting to this one engenders a sense of pressure and release, the impression of a hand squeezing the space and then letting go. You can almost hear it pop. This exchange of tension is followed by another bout of pressure, courtesy of the twelve stripes comprising the next work, “Untitled (Friendship),” with a palette of pale blue against a darker blue. The dark/light schema of the first painting is reversed, with the lighter color at the top and a slightly deeper one on the bottom. Almost imperceptibly, Martin has included a very thin border of pure white underneath each of the darker bands, with the exception of the lowest rung. This configuration somehow infuses the surface with the imperviousness of a brick wall (with the thin white stripe acting as the mortar), but its solidity is immediately undermined by the airiness of the piece to its right, “Untitled (Perfect Day),” a white field with three blue bands running across the top, bottom, and middle. The resulting broad white swaths, three times the width of the stripes, convey the brightness of daylight while manifesting an unexpected bluntness, a side effect of the composition’s simplicity, which abruptly downshifts into the mistiness of the neighboring canvas, “Untitled (Ordinary Happiness)” — six narrow blue stripes against five white bands, an arrangement that maintains an air of both buoyancy and authority. The following painting, “Untitled (Innocence),” a white-on-white haze of five thin white stripes against six blue-white bands, all but vanishes before your eyes, while the last work in the room, “Untitled (Playing)” — the most complex of the group despite its Spartan simplicity — incorporates thin stripes alternately colored white and dark blue (five of the former, four of the latter), which divide a light blue field into ten bands. The crisp partitioning of the composition feels like the inverse of the previous piece, a stark contrast between a humming machine and a silent whiteout. And then there are the surprises in store as you move forward and back in front of the individual canvases. The blue-on-blue painting with the white borders (the third work along the clockwise path from the doorway) is the most mutable. You don’t notice the white stripes at first, just the remarkable solidity of the bands of blue paint. They emerge as you walk toward them, only to disappear, like whitecaps on a choppy ocean, as you back away. The closer you get, the more sensual the revelations: the little jag in the graphite line, where the artist moved her ruler from one section the next; the swaths of white paint that lip over the graphite and at times obscure it altogether; the ebb and flow of the particles of pigment traveling like a shallow river across the blue bands. Martin painted from inner visions. She would destroy canvas after canvas until she achieved the image she held in her imagination. The washes and strokes of color — the barely perceivable footprints leading toward that interior source — are what pull us in, holding us rapt in the painting’s pulsating nothingness. It’s that intimate vibration, animated by daylight and passing shadows, that can’t be captured with a lens. The camera freezes the painting’s soul. 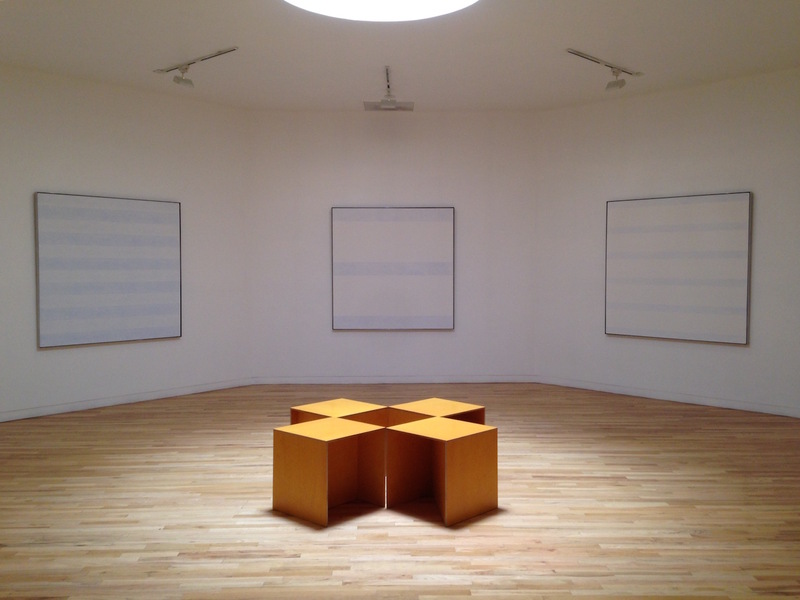 The Agnes Martin Gallery is on permanent display at the Harwood Museum of Art (238 Ledoux Street, Taos, New Mexico).